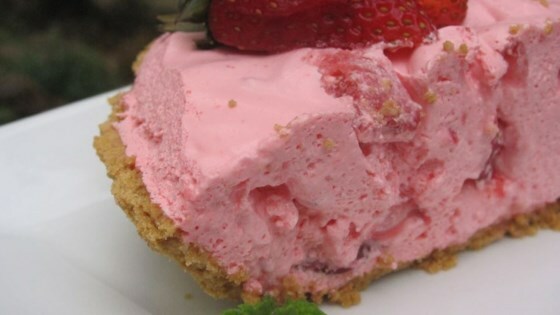 "Fluffy mousse is made with strawberry gelatin and whipped topping and piled into a graham cracker crust with sliced strawberries." In a medium bowl, combine gelatin and boiling water. Stir 3 minutes, or until gelatin is dissolved. Add ice and stir until gelatin thickens and cools. Fold in the whipped topping and strawberries. Chill until mixture will mound, then spoon into crust. Refrigerate for at least 2 hours before serving. Maybe I did something wrong, but when I made it the pie never really set. Also a little too much strawberry flavor for me, I might try it again using pudding instead of gelatin.